Taking love of pizza to the next level. 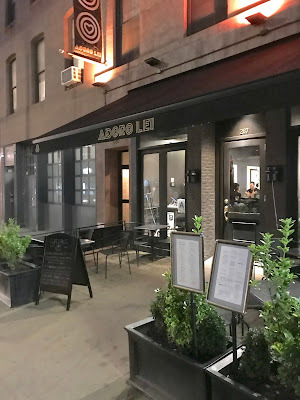 After visiting Hudson Square's Adoro Lei I think my feelings toward her are similar to the translation: I adore her! I love the hip vibe of the open dining area that is somehow perfect for a group outing yet intimate enough for a date. When combined with the attentive and accommodating staff, Adoro Lei is a match made in heaven. But the thing that brings it all together is the pizza. Not one, but two ovens tended by kitchen staff that knows how to use them. Whether you want a huge New York brick oven pizza or a fancy wood-Fired Naples style pie, Adoro Lei has got you covered. I recommend both. These are serious pizza folks that know how to please their patrons desires. My two favorites were the Round Square and the Eggplant Supreme. Even for someone that doesn't like eggplant, this pie was love at first bite. The Eggplant Supreme pizza combines all the best parts of an eggplant parm on top a pizza! Is their eggplant parm just that good? or has Adoro Lei developed a game-changing recipe? And how is a red plain-looking pie like the Round Square with no mozzarella pack so much flavor into every bite? These are the mysteries I intend to solve. I could use help on this case so join me in this labor of love at Adoro Lei. 1. Tony Zackin is nearing the launch of a software solution he has been working on for years. He also gave the suggestion for Robin's Fringe NYC show of a famous woman from "herstory" - Marie Curie. 2. Kitty Silverman offered up her shawl as a prop for Robin's Fringe NYC show. 3. Paul Rothman and Lily Rothman are moving to Las Vegas, Nevada very soon. We hope to celebrate a housewarming with them sometime around Thanksgiving.